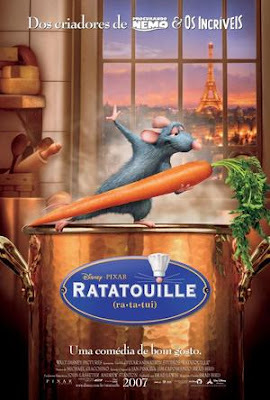 Fun Life in The Kitchen: Anyone Can Cook - Fun Chef Movie "Ratatouille"
Ratatouille -- a story about a talented chef,a mouse named Remy,who help a passing execellent chef's son to acquire his father's restaurant and conquer the carping critic. Ratatouille -- (EGO)In many ways the work of a critic is easy. We risk very little, yet enjoy a position over those who offer up their work and theirselves to our judgement. We thrive on negatitive criticism, which is fun to write and to read. But the bitter truth we critics must face is that in the grand scheme of things, the average piece of junk is probably more meaningful than our criticism designatint it so. But there are times when a critic truly risks something and that is in the discovery and defense of the new. The world is often unkind to new talent, new creations. The new needs friends. In the past, I have made no secret of my disdain for Chef Gusteau's famous motto:"Anyone can cook. "But I realize only now do I truly understand what he meant. Not everyone can become a great artist, but the great artist can come from anywhere. It is difficult to imagine more humble origins than those of the genius now cooking at Gusteau's, who is, in this critic's opinion,nothing less than the finest chef in France. I will be returning to Gusteau's soon, hungry for more.